This past Saturday, October 6, the United States Navy commissioned its newest guided-missile destroyer, the USS Michael Murphy (DDG 112), at pier 88 in Manhattan, New York City. This ship honors Lt. (SEAL) Michael P. Murphy, a New York native who was posthumously awarded the Medal of Honor for his heroic actions during Operation Red Wings in Afghanistan, June 28, 2005. Among other distinguished guests, in attendance for the commissioning ceremony were the Mayor of New York City, the Honorable Michael Bloomberg, the Secretary of the Navy, the Honorable Ray Mabus, and Chief of Naval Operations (CNO), Adm. Jonathan Greenert. Also present was Adm. William McRaven, Commander, U.S. Special Operations Command. It was Adm. McRaven’s four-minute remarks during the ceremony that stood out to me, and is the subject of this post. “Michael Murphy represents all that is good about our special operations warrior. And, to have a fine fighting ship named after him is the highest compliment one could’ve paid to Murph, and all the SOF soldiers and SEALs who perished that fateful day,” Adm. McRaven said. “In the SEAL teams, the greatest compliment one SEAL can bestow upon another is to call him a teammate. It’s a simple term, but it conveys everything about how we live, how we fight, and sometimes how we die,” Adm. McRaven said. What is a teammate? Watch the video below, and let Admiral William McRaven define it for you. The following video is a combination tribute to Lt. (SEAL) Michael Murphy and remarks by Adm. McRaven from the ship’s commissioning. Unfortunately, I was unable to embed the raw video from his speech. But, you can find the original video HERE. But, the video I am presenting here is quite touching. Adm. McRaven’s remarks, along with the music and images in the video, make it perfect for this post. Lt. (SEAL) Michael P. Murphy lived, fought and died a teammate to his shipmates; a teammate to the end. To the crew of the Michael Murphy, you have a legacy to uphold. Murph would expect anything bearing his name to be battle-ready at all times; to go in harm’s way when the Nation calls, and to bond together as teammates, knowing that it’s not the metal in the ship that makes you strong, it’s the hearts and souls of her crew that make her invincible. 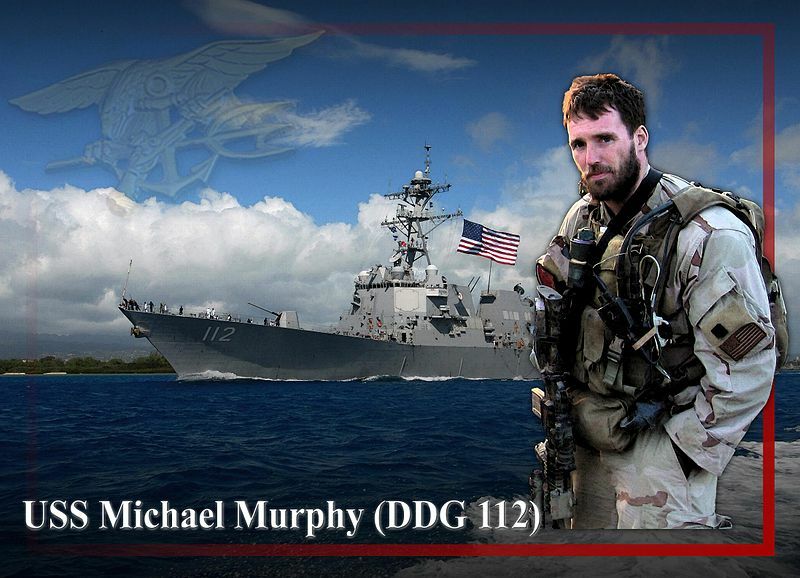 To the officers and crew of the USS Michael Murphy, may Michael’s spirit steady your resolve and guide your every deed. I wanted to use this post to discuss The process of empowerment, the guiding principles of workplace empowerment and empowerment in management. Empowerment is the process of increasing the capacity of individuals or groups to make choices, and to transform those choices into desired actions and outcomes. [iii] In today’s workplace, people quite often endure the absence of empowerment and carry on like robots doing as they are told. Empowerment unleashes an individual’s potential and enhances [their] ability to promote creativity and productivity in the organization. [iv] Some might call empowerment a buzzword. But, empowerment is being increasingly embraced by more and more managers and leaders in both the military and the corporate World. And, quite honestly, people are hungry for empowerment. Decision-making in many organizations and corporations is currently too top-heavy. Decisions need to be pushed down to the lowest level possible. But, in some instances, managers and executives are afraid to relinquish some of their authority. They feel that doing so would be too risky, fearing that they would have less power, diminished control or might lose their job. But, the true risk is to not embrace some form of an empowerment process. Empowering others is essentially the process of turning followers into leaders. Through empowerment, there are fewer levels of decision-making. As a result, there are reduced levels of bureaucracy, and organizational pyramids are flattened. Managers trust employees to make decisions, and the staff trust managers and feel supported in their decisions. In some instances, procedures and guidelines are generated by the people who perform the work every day. Through empowerment, good ideas and decisions are implemented faster. Ultimately, empowerment creates confident and competent employees who are more productive because they are not waiting for approval to make decisions. But, empowerment is not something you just simply turn on like a light switch among your staff. You don’t show up one day and say, “you, the people, are now empowered!” For all involved (leaders, managers, employees, etc. ), it is a process of education, knowledge and experience, where the staff is provided the criterion which directs them in making decisions in their respective jobs, areas of expertise and departments. If the staff has the basic guidelines, they should be able to make educated and informed decisions without having to go to the next level. As a result, the customer is served, or the mission is accomplished, more quickly and effectively, and managers are freed to make decisions that really require their level of expertise. It is in this way that all staff has the information they need to be truly empowered to collaborate effectively. A process is developed to continue the culture change so that there is true empowerment for informed decision-making. Through this empowerment process, a new organizational culture is established; a culture where management encourages teamwork and risk taking, and employees can establish teams where they see the need. From this teamwork, creativity and initiative are fostered. As leaders, we should strive to cultivate leadership not only in ourselves, but in those we are responsible to lead. As leaders, we shouldn’t think that we have all of the answers. As leaders, we don’t know everything. As leaders, we should be surrounding ourselves with capable, knowledgeable people who can take much of the decision-making burden off our shoulders; where employees own their work and are more accountable for outcomes. There becomes an environment where future leaders are developed and nurtured for the future. When people are empowered with the knowledge and tools to be successful doing their jobs, their confidence breaks down the intimidation of any task, and they are energized to do their jobs well. When people know that the leash is off their neck, and their boss is not breathing down their neck, they become some of the strongest and happiest people. Empowerment is about making sure that people are well-trained, they have the tools to do the job, and are given the autonomy to take risks and to think outside the box. A truly empowered team can do great things, and as leaders we need to stand back and let them succeed. *Portions of this blog post were adapted from a presentation entitled, “Empowerment & Decision-Making – Building a Framework for the Future.” This presentation can be found at the link http://www.maine.gov/labor/bendthecurve/minutes/empowerment.pdf, through the State of Maine’s Department of Labor website (http://www.maine.gov/labor/), and their Bend the Curve initiative. 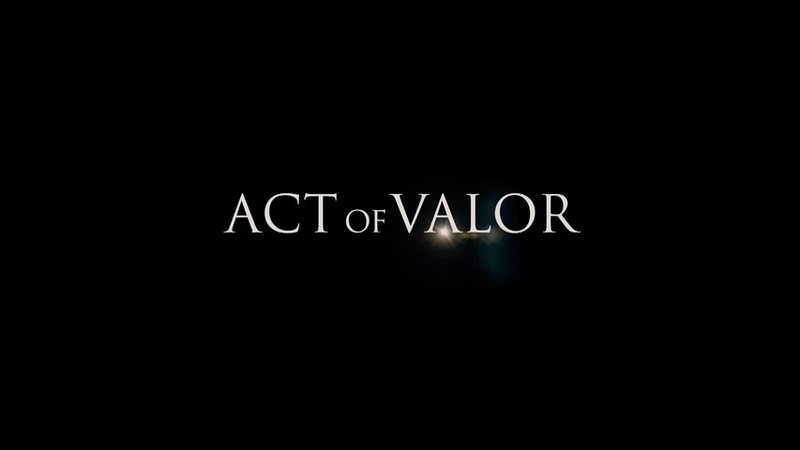 Act of Valor is a very powerful movie. From the personal side of the lives of those in the military, to the fight they face on the front lines in today’s dangerous World, Act of Valor takes you on suspense-filled missions of today’s Navy SEALs. Although the movie is fiction, you cannot come away from it thinking that the scenarios presented could never occur; they very well could occur. The members of our military put their personal life on the shelf to go fight our wars. They leave the ones they love, and the safety of their homes, to go to all points around the World to take the fight to our enemy, so that the enemy never brings the fight to our shores. The movie reveals the sacrifices of our men and women, who respond when called, to dedicate themselves to the profession of arms, and the courage it takes to do so. A very good quote from the movie captures all of this very clearly: “If you’re not willing to give up everything, you’ve already lost.” Our country was founded on this principle, and our military fights for our freedoms and liberties according to it, and damn few choose to make the sacrifices to fight for their fellow-man. Those who do certainly give up everything for us. When I was driving home from the movie, it was a beautiful day, with clear blue skies. Although there was a chill in the air, it certainly looked like a spring day. The movie had certainly put my mind into a different perspective, and I found myself embracing what we take for granted as citizens. Of course, on the road with me were people in their hustle and bustle to get to wherever their lives were taking them; for most, I am sure, not a care in the World. I assure you that I was paying attention to the road, but I couldn’t help day dreaming about the things we take for granted. Here we are, on such a splendid day, enjoying our freedoms; freedom to go to the mall, to church, to school. While there are men and women facing the grueling challenges of fighting our enemy, we’re enjoying life. My mind split between the image of that day’s beauty with that of the images from the battle scenes of Act of Valor. I thought to myself, “At this moment, there is a soldier somewhere in this World attempting to gain entry into a dilapidated shack in Afghanistan (or anywhere) to eradicate an insurgent who wants nothing else but to destroy our way of life, uncertain of what he might find on the other side of the door. And, here I am…driving to my home on a beautiful sunny day in my home town.” Meanwhile, the men and women of our military have put their sunny days aside so that we can enjoy ours. An unprecedented blend of real-life heroism and original filmmaking, Act of Valor stars a group of active-duty U.S. Navy SEALs in a film like no other in Hollywood’s history. A fictionalized account of real life Navy SEAL operations, Act of Valor features a gripping story that takes audiences on an adrenaline-fueled, edge-of-their-seat journey. Act of Valor follows a Navy SEAL squad on a covert mission to recover a kidnapped CIA agent, which unexpectedly results in the discovery of an imminent, terrifying global threat. An elite team of highly trained Navy SEALs must immediately embark on a heart-stopping secret operation, and in the process takes down a complex web of terrorist cells determined to strike America at all costs. Act of Valor combines stunning combat sequences, up-to-the-minute battlefield technology, and heart-pumping emotion for the ultimate action adventure film–showcasing the skills, training and tenacity of the greatest action heroes of them all: real Navy SEALs. The filmmakers had unprecedented Naval access resulting in never-before-seen military operation scenes which are composited from actual events in the lives of the men appearing in the film and their comrades. Oh, and did I mention that they’re using REAL BULLETS???? The Command Performance Leadership blog has enjoyed some early success in its less than three months of existence, with weekly readership growing and the number of followers gradually increasing. Of those who have frequently visited my blog, I have been quite fortunate to attract many members of militaries from around the World, at different levels of leadership; non-commissioned officers (NCO’s) and commissioned officers. Having a military readership and followership is important to me, as I want military members to provide their input, through blog post comments, to gain from their knowledge and experience, and to add value to this blog. Who better to provide insight on military leadership fundamentals and wisdom than those who are leading in our military. As you’ve seen, a few comments from military members have influenced the discussions here, and have inspired new content and articles. I hope that continues. A few weeks ago, I introduced BookLink, a feature that provides this blog’s readers the opportunity to have direct and complete access to military-oriented leadership books, pamphlets, field manuals, and other resources of information. The first book I am featuring is the U.S. Army Leadership Field Manual, which we began reading on January 16. For the four weeks that follow, sections of the book are being read and discussed in weekly blog posts. Last Thursday, I received a comment about this Army field manual from David Hickman, a U.S. Army NCO. In his comment post, he shared a comprehensive story about leadership in the Army, in his opinion. I replied to David, and started a dialogue with him about his comment. He informed me that his comment was actually an article he was attempting to get in front of a few military magazines to take interest in. Unfortunately, no military periodical has taken interest in his article. David explained that the article was written in response to his Company Commander asking him and his fellow NCO’s to define leadership and what it meant to them. He thought that leadership deserved more discussion than just a ‘definition,’ and that leadership is nothing unless we act upon it. David informs me that this article is the framework for a book he is interested in writing. I told David that his article deserves to be read, and I offered the article to be posted here at Command Performance Leadership as a guest post. He accepted my offer. I have made slight modifications to the original article to correct any grammar, spelling and punctuation, but have not altered its content or changed any words. I have also added some approprate and related pictures. Staff Sergeant (SSG) David A. Hickman is currently assigned as an instructor with Charlie Company, 2nd Battalion, 11th Infantry Regiment (IBOLC), 199th Infantry Brigade, Fort Benning Georgia. From the start of his tenure in the Army to present, SSG Hickman has served with the 1st Stryker Brigade Combat Team (SBCT), 25th Infantry Division, the 172nd SBCT Fort Wainwright, the US Army Recruiting Command, the 25 Infantry Division (L) Schofield Barracks, Hawaii, and with the 7th Light Infantry Division (Cohort), Fort Ord, California prior to a break in military service. He deployed with the 1st SBCT, 25th Infantry Division to Baqubah, Iraq from 2008 to 2009, with the 172nd SBCT to Mosul, Iraq from 2005 to 2006 and Baghdad 2006, and the 25th Infantry Division (L) with the Multi-National Forces and Observers (MFO) to Sinai, Egypt in 2000. He has served as an Instructor, Platoon Sergeant, Weapons Squad Leader, and Team Leader. I had some reservations about publishing this paper that I wrote last year for concern that others would think ill of me or that it was an attempt to curry favor. At some point in life you will be confronted with a choice: simply speak your mind regardless of what others may think of you [, or to say nothing at all]. A few military magazines looked it over. It’s my take on leadership from those who were with me state side and Iraq. Singular perspective in the mind of any leader will lead him to fail. If uncorrected, it will pass to the others around him and the organization will follow. This is still true, but the focus of a leader should be on the effects of his or her leadership. Further, if leaders do not grasp the “human aspect” of leading, how can the organization improve? A number of us may overlook the cause and effect of leadership or the lack thereof. Poor leadership or leadership “in part” will not result in just failure alone when the cost paid for the lack of leadership may be another human life. Leaders at every level should agree that there are two elements that make up any mission-oriented organization, those who follow during mission execution and the select few who lead them. Both are required to achieve any task that places the organization in a tactical advantage over another or to restore security. Failure by either will leave the unit with an incomplete task and lack of sufficient support to accomplish it to the fullest benefit of the organization. From our perspective, the odds will not be in favor of those left to deal with the failure of any leader or subordinate. Most of the failures of subordinates can be traced to their leaders. However, after a leader has implemented every measure of instruction and attention that can be given, a subordinate may still make the wrong choice. He or she is, in fact, just as human as their leaders, and that Soldiers’ free will may not always sway to do what is right. Regardless of the origin of the fault, we as leaders accept responsibility for what our subordinates do right and wrong. This approach to leading helps leaders to focus even further on their subordinates. The Army is the one institution in which the leader accepts the fault for what their subordinates fail to do. There is no blame. With regard to ethical decisions, there may be an unseen flaw within the subordinate’s moral judgment and character. As leaders, we spend time guiding subordinates both during training and after hours with regard to their personal actions and choices. We remind them that poor choices can lead to adverse actions which will be detrimental to their privileges and rank. How often do we convey to our subordinates the “effects” that their actions can have on others in the organization? How can we as leaders become more efficient in identifying the start of potential issues if the leader is not involved in the personal lives of their subordinates? Rank has never been a requirement to lead. Rank never compels a Soldier to push himself beyond the limitations of his mind. Determined young Specialists can take charge and lead if they have been under sound leaders during the first part of their tenure in the military. Many of us have seen this. Rank is needed, but it is nothing more than a visual hierarchy that displays a level of authority that an individual leader has been entrusted with, not entitled to, for his or her position of duty. It is visible within the organization at every level. 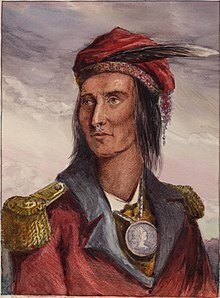 Our character must be balanced with regard to the rank that we hold and the rank that we advance to. At one end of the extreme, if we are not balanced in character, we run the risk of abusing our authority. Worse yet, at the other end, we fail to provide for our subordinates in training or human needs. Human needs go beyond those that are required to survive in the physical body. All leaders should have learned this as they advanced up through their respective positions of authority, or so we think. Avoiding the mistake of promoting individuals with poor character or weak leadership ability is perhaps the one fact that causes leaders to have reservations about a Soldier being promoted to the rank of Sergeant based on time in service alone. Serious consideration needs to be taken when selecting subordinates for promotions. If we receive a leader who was promoted in this manner, all we can do is take what is there and make it better. In so doing, there are two points that leaders need to keep in mind when assessing incoming leaders who will either be our subordinates leaders, peers and Senior Leaders. First, the leader has no insight as to the methods of their training and mentorship. Poor leaders create more poor leaders, and bad habits carry from one to another. Every leader has faults and may fall short in some aspect of his duties, but it’s the leaders who choose to address these issues who become leaders of genuine character and look beyond “self” seeking to improve. Second, even if a leader has been instructed in the requirements of basic human needs, it is still not evidence that this leader is in practice of executing the correct actions of leadership. Instructors in the Army Education System are in place to develop “line leaders” to better the organization. One unavoidable fact is that instructors are only with their respective student leaders for the duration of the developmental course. Course curriculum “highlights” the “job aspect” of their responsibilities and many leaders end up getting pushed through the course, keeping to the weekly schedule so long as all attendees receive passing scores on their exams. Instructors cannot fully evaluate leaders with regard to their ability to grasp and understand the “human considerations” in leading and developing their subordinate leaders and subordinates. Leaders on the line spend a good deal of their time involved daily with their Soldiers, but if the line leaders did not have the proper mentorship during their development, they will not be “in tune” with the human side of subordinate development. Many leaders in the Infantry often face the “taboo” designation as being a “Joe Lover” when other leaders witness the care for the well-being of subordinates. I agree that there needs to be a balance, but all leaders need to be attentive to the emotional and other human needs of their Soldiers. Neglect or failure to provide opportunity to resolve issues affecting emotional needs will allow doubt to enter the minds of subordinates causing instability in their emotional well-being. Issues left undone will foster an unfocused mind during the execution of missions. A subordinate who is not focused on the mission will prove to be detrimental to himself and those around him, which can result in the loss of life. The efforts of an unfocused Soldier provide nothing more than a void in security. He or she is of no use to the organization in their present state. Leadership has focused mostly on compelling our subordinates to execute missions that affect those within the organization at every level as well as the host nation in which the organization operates. This is still both true and necessary for achieving the mission as set forth by the intent of any Commander. With regard to our history of leadership, mission accomplishment was a top priority regardless of the effects in human costs and subordinate needs. Today we recognize that care for the human side of our Soldiers is a fundamental requirement for the operation of a successful organization. It should never be to a point where subordinates become soft or fall short in standards, but there needs to be a balance between the two. Mission accomplishment is still top priority, but we cannot ignore the human side. On today’s front, leadership often involves directing and continually encouraging subordinates to execute tasks that would normally be against any human will if given a choice because it places them in danger. For this reason, Soldiers and Leaders need to understand that being a Soldier is not just a “job” and should never be considered just a career. In truth, it is a profession that requires a great deal of personal conviction. We chose our profession and we also chose to lead well, in part or not at all. Whatever measure of effort we put into our leadership, it will be visible through our actions and the performance of our subordinates. Leading Soldiers will always have results and consequences. Choices in leadership will always have effects. Good or bad. How do we accomplish the task of leading subordinates in the execution of missions that could result in the loss of life? Further, how can we grasp the reality of both our will and that of our Soldiers to strive for mission success during which it’s execution we’re acutely aware that it could be our lives that are lost? We as leaders must also be prepared to both witness and deal with the loss of those that we serve with as leaders and those with whom we lead. We’ll also deal with the emotional effects of our remaining subordinates that will be brought on by the death of a peer. I want to pose two questions for thought and a genuine inward reflection for all of us as leaders. This is the only time that “self” needs to come first; when assessing one’s character as a leader. What if that loss of life was due to the failure on our part to lead effectively? Do you really think Soldiers will be unaware of our part in this failure? This is reason for absolute personal conviction within every Soldier. Most especially those in the ranks of the Infantry and Combat Arms, but all Soldiers facing adversity and genuine risk of death fit this category. With regard to personal conviction, if Soldiers and Leaders do not have within themselves a sense of duty and belonging to each other, their unit and Nation, they do not possess genuine personal conviction. Conviction and belief in the preservation of the well-being of our subordinates and one another are the traits of selfless service. These traits are present within the character of only a few. Most new Soldiers use the military as a “test bed” for figuring out their lives and what they want. Leaders have the responsibility to instruct their Soldiers on the importance of selfless service. Further, while it’s ok for them to figure out their lives in the Army, leaders must help them grasp the reality that the effects of their choices have much more “gravity” when the organization as a whole must deal with the outcome. All Soldiers must understand that our purpose is greater than ourselves and we must implement sound judgment in every decision that we make both on and off duty. This personal conviction motivates these Soldiers and Leaders to give of themselves. When Soldiers see their peers wounded and regrettably at times their death, it will cause them to appeal in action on behalf of those around them that have fallen. The decision to step forward and take this action is the ultimate form of selfless service. This kind of selfless service happens often within our ranks. Our appreciation to one another for such actions is evident, but seen only by those who endured with us. In one previous unit, our Battalion Commander made it clear that there must be a complete “buy in” in the unit mission and the Commander’s intent for that unit to succeed. Perhaps this instruction came from higher. I agree if the cause is just and there is no violation of moral character or ethics during mission execution. This applies to both tasks within the organization or any act carried out among the populous of the host country. In the countries we operate, there will be those of a mindset that follow extremist beliefs that justify the deaths of their own people. This will make it difficult for Soldiers to execute a Commander’s intent without individuals of this mind-set feeling as if the Americans are violating their morals and ethics. Their beliefs are not only contrary to good civil order, but also the entitlement of every human being to dwell peacefully. Our efforts are generally an “effect” of good leadership during the execution of operations that preserve the human entitlement of peace. Peace that at times cannot exist without selfless service and sacrifice for those who are unaware what is given for them. It is a basic human need. When viewed from the perspective of humanity, freedom can no longer be restricted within the boundaries of our country. Each and every one of us should reflect inward and ask ourselves, “Am I here just for a career or just to be a Soldier and Leader?” If the answer is “just a career” you have no purpose within the ranks of the Infantry or any branch of the Military service. If a Leader or Soldier is only interested in a career alone or the pay, their first thought will be for “self” rather than “others”. During training and actual missions, the benefit of others and the organization will not be first in their minds. If leaders think this way, what will be the outcome of their decisions? Soldiers and Leaders of this character will never be willing to give of themselves or only give enough if there is some personal gain to be attained. Such gains could be the possibility for advancement in rank or to produce a “false perception” of one’s character in an effort to look good in the presence of superiors and not living sound leadership daily. True leadership serves a higher purpose and benefits those above and below us. Leaders focused on “self” do not see the results of the implementation of good leadership. The end-state is the efficient execution of any task. Tasks or missions executed more efficiently will result in less chance of fratricide and the unintentional killing or wounding of civilians. All of which will affect the organization at every level. Genuine leadership is often thankless and any leader not driven by a “career” must understand that the best leadership often goes unseen, even by those that they lead. Subordinates are usually unaware of the sacrifices that leaders make on their behalf. Sacrifice of time, sleep or food. The list can go on. I am comfortable with this, because the daily tasks that need to be carried out are done so efficiently. This creates an environment with less stress. The “machine” runs smoothly. An atmosphere with less stress on subordinates keeps their minds clear and focused when it comes time to execute missions that have a high level of stress and personal threat. The same holds true for tending to the needs of Soldiers with regard to spiritual and emotional needs. For this reason, it’s necessary for leaders to be involved in the lives of their subordinates. Even simply stopping by the barracks during the week-end for a brief check on their Soldiers is important. At the time the subordinate may feel as if their leader is intruding, but usually it is appreciated even if the subordinate never expresses it. Caring for the well-being of subordinates does not stop after the unit gets back from the field, refit is complete, and everyone is on their way after the safety brief. A subordinate’s problems become the problems of their leaders all the way up through the Chain of Command and NCO Support Channel. Don’t ignore it or expect that the Soldier knows how to best deal with the issue. When deployed, if a subordinate learns that they have lost their spouse either to death or even if it’s a fidelity issue, their mind will not be clear during missions. It would be wise to leave this Soldier off of a few patrols in conjunction with seeing the Chaplin and other elements within the military that are present to help service men and women deal with problems. Leadership is never executed for the recognition of “self” by higher leaders. Leadership is any action on my part to train and move my subordinates, conveying to them that this action must be executed for a greater good that affects their lives as well as others. It is more important than ourselves, and requires our genuine attention if it is to be successful. If we fail those who follow us may fail, leaving the task undone. Every action we perform and every decision we make as leaders will have an effect on someone. This is why knowing the “definition” of leadership is not leadership. Our actions, decisions and our example are what “cause” the desired “effects” needed for a successful organization. Our country was founded on an unwavering belief in God and self-sacrifice for the whole rather than “self”. Our history reflects that we have a great nation, so I am inclined to believe that their belief in God and selfless actions were just. Regardless of belief in faith, race or ethnicity, leadership is required to succeed. Human needs are the same for all. Self-sacrifice will be demanded of any nation that expects to prosper and preserve the freedoms of its populace or the freedom of other nations who cannot stand for themselves against an oppressor that deprives them of such basic human entitlements. Leaders should never forget that even though his or her selfless service goes unseen, there is always someone looking for our faults as leaders. It will either be someone who only has the intention to point out our faults simply to correct and develop us or it very well may be a leader who is focused on “self” and looks for fault only for the gratification of holding their authority over you. Regardless of which, if we maintain our character and hold ourselves responsible for our duties, they will find very little to point out. But, this requires genuine leadership, daily selfless actions and the ability to look inwardly at our own character. When there is fault, do not let pride prevent the correction of your actions and character. If we are not cautious, we as leaders can become more concerned about how we look with regard to our Officer Evaluation Reports (OER) and Non-Commissioned Officer Evaluation Reports (NCOER) rather than taking care of our subordinates and the greater good of the organization. If we do not conduct an occasional “self-check”, a leader can develop a “power trip” or an attitude of “self” rather than executing good leadership. Subordinate leaders and Soldiers will see through it as well. This is often seen in a few newly promoted leaders advancing to a higher level of responsibility. Leaders should always be humble enough to remind themselves that the Army is still a “human organization”. That being said, we as leaders can make mistakes. We must never let anything prevent us from addressing our short comings. We all must understand that no matter how high in the Chain of Command or NCO Support Channel we advance to, we can still learn more, improve and develop ourselves. The truth is never tasteful when it is not in our favor. One simple example is choosing the “easy wrong” over the “hard right” or being guilty of choosing “self” over the benefit of those around us. It happens more than we may think. It is still a truth that will eventually be seen, revealing our intent. We need to correct whatever prevents the truth from being in our favor. The majority of Leaders are of genuine character, but being human it’s always good to check our own character, giving our “moral compass” a quick shake to be certain that we’re on the right path regarding our leadership and that “self” comes last. The Seven Army Values are a good corner-stone if we as Soldiers and Leaders practice the values rather than just committing them to memory. If all Soldiers and Leaders choose to serve others rather than “self”, the organization as a whole will be in good care. The choice of “self” will never need to be addressed because your peers and leaders will see to your well-being and you theirs. [i] “Army Leadership: Competent, Confident, and Agile.” Washington, DC: Headquarters, Department of the Army. 2006. Print. p. 1-2. David Marquet is the founder and President of the consulting firm Practicum, Inc., and creator of the blog Leader – Leader (Leader to Leader). For those of us who are acquainted with David on social media, such as LinkedIn and Twitter, he often posts words of inspiration and motivation that are sometimes offered as points to ponder; things to make you stop and think. David’s messages inspire the empowerment of engaged people and leadership at all levels. He encourages leaders to release energy, intellect, and passion in everyone around them; to develop leaders not followers. This obviously comes natural for David, as he has been an inspirational leader, taking people and organizations from good to great, since his days in the Navy. Modern business requires moving beyond hierarchical leader-follower structures. The fastest and most effective way to accomplish this is by getting everyone in the organization to think like leaders. Practicum’s leadership development programs and leadership consulting stress empowerment over ego and process over personality. By learning to implement these ideas you will develop leaders throughout your organization and take the first step towards long-term organizational success. Great Leadership requires accomplishing three things. First, it must create a highly effective organization with superior morale. Second, leadership practices must be embedded into the fabric of the organization, beyond the current leader, to create an enduring leadership mentality. Finally, Great Leadership creates an organizational culture that spawns generations of additional leaders throughout the organization. Accomplishing all three pieces of Great Leadership requires rejecting the traditional notion of leaders and followers, and instead embracing the concept of leaders and leaders. This method of leadership is based on empowerment, not ego, and process, not personality. On Friday morning (Feb. 10), I saw one of David’s inspirational posts. It said, “Leadership is an action, not a position.” This simple quotation inspired me at that moment, and I thought about what David was saying. Nothing happens without action. Too often, people who call themselves ‘leaders’ fail their followers by not leading, and not inspiring action through those followers. This is one of my biggest pet peeves about leadership, and it bothers me that there are followers out there who are not being properly led. It bothers me that this kind of leader does not care about the fundamental growth of their followers. It bothers me that those followers are not finding the success they deserve because they have inept leaders who care only about their next promotion. “Give a leader a title, he’s only as ‘good’ as his character will allow. Give a leader a responsibility, he’s only as ‘good’ as his people. 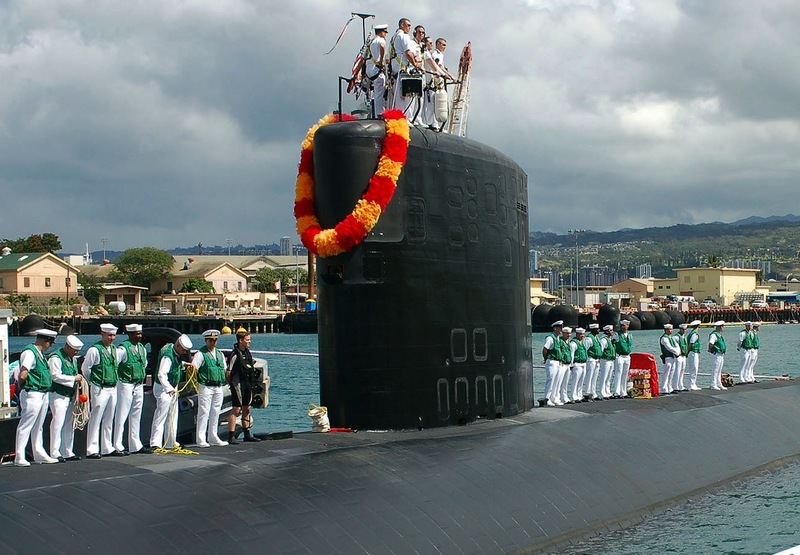 Deep Blue, an internal Navy think tank founded in the wake of 9/11, is being given a far broader role within the service by Adm. Mike Mullen, chief of naval operations (CNO). Deep Blue’s primary bailiwick was to provide the CNO with ideas about how to better support joint combat operations and advise him on his roles as the Navy’s service chief and a member of the Joint Chiefs of Staff. But Mullen has expanded its purview to include short-notice staging of naval and joint force maritime component commanders to provide “deliberate, contingency, crisis and exercise planning.” Top officials of Deep Blue began reaching out months ago to Navy component commanders to support their planning needs and bolster tepid support within some sectors of the Navy. The office now is internally being revamped to handle its broader role under Mullen’s aegis. Deep Blue’s new role is envisioned as similar to that of Checkmate, the lair of Air Force air and space power strategists that provides the Air Staff and warfighters with options that are logistically supportable and politically feasible. Founded in the mid-1970s, Checkmate provides research, analysis, operational planning and strategic concepts development. Admiral William McRaven was the Special Operations coach for SEAL Team Six for the operation that brought down the World’s leading terrorist, Osama Bin Laden, last May. And, last night, Both Adm. McRaven and SEAL Team Six had another big night. 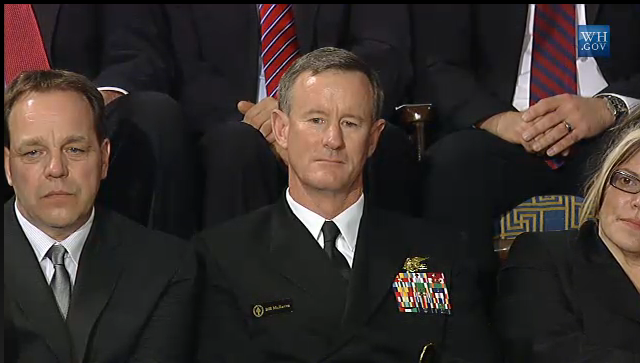 Adm. McRaven was the guest of Michelle Obama at her husband’s State of the Union Address. And, before President Barack Obama’s speech to combined session of Congress and the American people, forces under Adm. McRaven’s command were carrying out a special operations mission to rescue two hostages from the hands of pirates in Somalia. Navy SEAL Team Six, the same unit that killed Al Qaeda chief Osama bin Laden, carried out a nighttime helicopter raid on Somali kidnappers during the rescue of American Jessica Buchanan and Poul Hagan Thisted of Denmark, aid workers taken hostage last October. Choppering 25 Navy SEALs into a populated area covered by the air defenses of an unsuspecting sovereign nation. Fast-roping them down into a fortified compound containing unknown numbers of enemies. Killing or capturing the world’s most dangerous terrorist. Extracting them safely and flying them to Afghanistan the same way they came. [iv] That was the plan. A daring plan that we now know was a great success, although one of the two Blackhawk helicopters that carried the SEALs into bin Laden’s Pakistani compound grazed one of the compound’s wall and was forced to make a hard landing. Osama bin Laden was eliminated, SEAL Team Six became American heroes, and Admiral McRaven became a household name. Fast forward nine months, and Admiral McRaven again finds himself front and center. Last night, he was one of Michelle Obama’s many guests, along with other military guests, at President Barack Obama’s State of the Union address. As the television cameras captured him sitting in the gallery of spectators, he appeared calm and composed. He did not look like a person who had just ordered the rescue of two hostages being held by pirates in Somalia, nor did he appear to be stressed or anxious about the mission’s outcome. U.S. military forces sent helicopters into Somalia in a nighttime raid Tuesday and freed the two hostages who had been captured on October 25, 2011. The raid was conducted by a joint team involving Special Operations Forces, including Navy SEAL Team Six, the same unit that killed Al Qaeda leader Osama bin Laden in May 2011. [iv] See Fox News’ television report on this raid at this link. The two hostages were freed uninjured after a shoot-out that resulted in nine of their captors being killed. There were no casualties reported among US forces. Last night U.S. Special Operations Forces conducted, by order of the President of the United States, a successful mission in Somalia to rescue two individuals taken hostage on October 25, 2011. Ms. Jessica Buchanan, an American citizen employed by the Danish Demining Group, and her Danish colleague, Mr. Poul Thisted, were kidnapped at gunpoint by criminal suspects near Galcayo, Somalia. Ms. Buchanan and Mr. Thisted have been transported to a safe location where we will evaluate their health and make arrangements for them to return home. This successful hostage rescue, undertaken in a hostile environment, is a testament to the superb skills of courageous service members who risked their lives to save others. I applaud their efforts, and I am pleased that Ms. Buchanan and Mr. Thisted were not harmed during the operation. This mission demonstrates our military’s commitment to the safety of our fellow citizens wherever they may be around the world. I am grateful to report that there was no loss of life or injuries to our personnel. Members of the military, and those who lead them, do not seek fame or fortune for the heroic acts they perform. They are doing their job. The results of their success are felt throughout America in the sustained freedom, and the protection from foreign aggressors who threaten that freedom, that we all enjoy. We sometimes take for granted what these men and women do, and we sometimes forget that they are out there doing these kinds of things when we least expect it. The members of SEAL Team Six deserve the recognition and praise on this day after such a daring and successful mission. 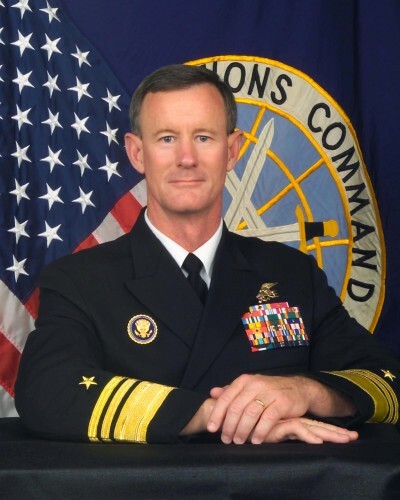 And, to Admiral McRaven, our gratitude for mastering the profession of arms and the ability to be a leader of character and a gentleman in the face of challenge and adversity. Admiral McRaven’s charisma displayed on Tuesday night is a true example of what our senior military leaders are all about. Good leaders are also good followers. Click the link below to follow this blog to receive notifications of new posts by email.